With a place you love and want to protect, out of sight does not equal out of mind. You can check and double-check every window and door; you'll still worry about your home away from home. Give yourself peace of mind this year with a smart home security system powered by Alarm.com. 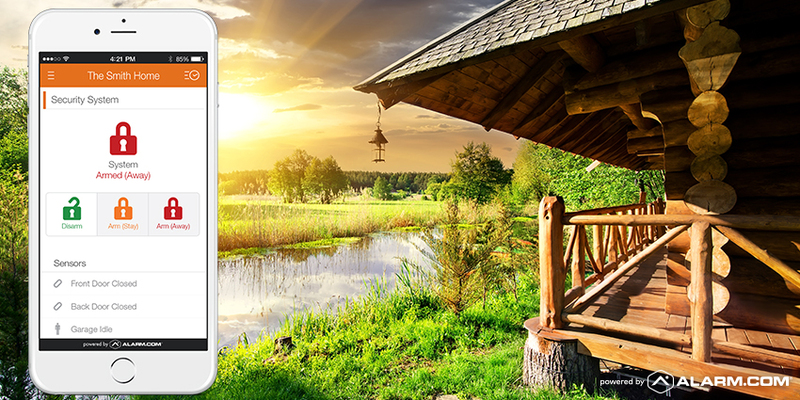 Our security technology proactively protects your vacation home all year round, both from crime and from everyday problems that arise when you're away. 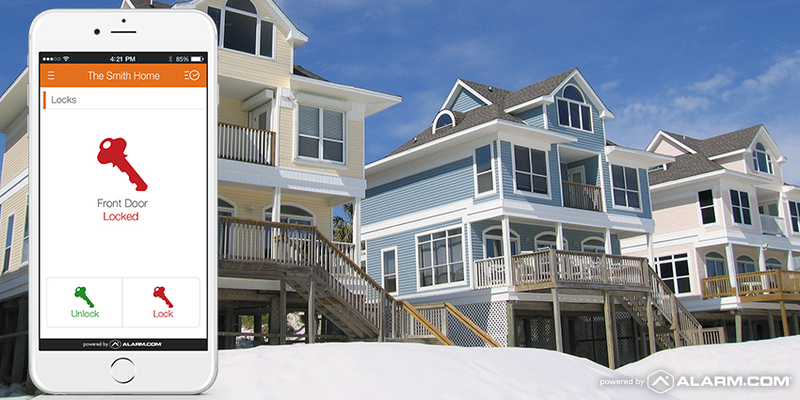 Controlled with a smartphone app, it lets you check in visually anytime and control aspects of the home remotely, giving you an instant link to your vacation home in the palm of your hand. Right now, there's an Alarm.com dealer near you who can quickly install and set up an Alarm.com powered system before you leave. Here's what you'll gain from this smart, affordable investment. All Alarm.com-powered systems come with 24-7 professional security monitoring. If an intruder breaks in, your system will quickly detect them and alert a monitoring station, where a security professional will assess the situation and dispatch local law enforcement. You'll get an alert too, but you won't need to call anyone or scramble for the local sheriff's number (calling 911 in your hometown doesn't get you there). Help will be on the way. If you're considering renting your second home to vacationers, smart access control is essential, and Alarm.com has a complete solution. You can create temporary, four-digit codes for your smart lock which expire after a set time. When your guests leave, Alarm.com deletes the code and they'll no longer have access. For trusted contractors, or a cleaning service, you can create a permanent code. You have the option to receive a smartphone alert every time a code is used, which makes it easy to keep track of who's coming or going. When you know the house is empty again, you can use your app to check the status of all locks, and re-arm your security system for protection. Your smart home security system can include an Alarm.com smart thermostat which gives you control of the property's HVAC system via your phone. This is particularly useful if you're renting to guests. You can set high and low ceilings on the thermostat which allow them to adjust it only within a given range, keeping your energy bills to a minimum while still allowing them to customize the temperature. When guests leave, you can set the thermostat back yourself to save energy, or have Alarm.com do this automatically when you remotely arm the security system. If there's ever a sudden temperature drop in mid-winter—indicating an HVAC malfunction, your thermostat will alert you so that you can arrange for a local professional to visit the house before any pipes burst due to freezing. A low temperature alert from your smart thermostat is just one example of how Alarm.com's technology can detect and respond to problems that other security systems can't notice. 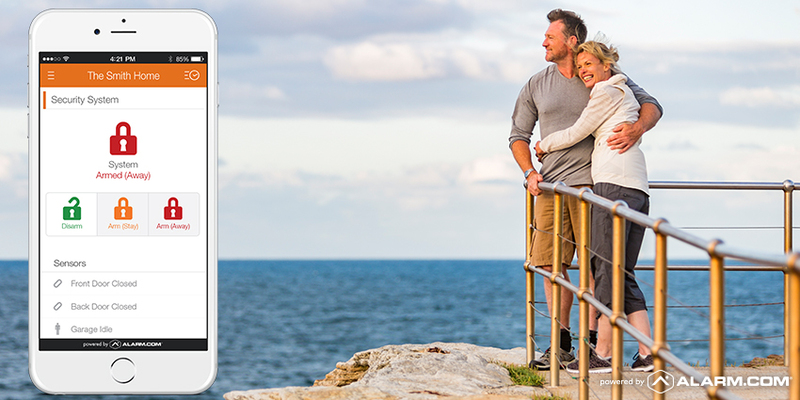 Alarm.com keeps you up to date on all sorts of important things, and it's easy to set up a range of smartphone alerts for different events around your property. Another example is water leaks, which can cause thousands of dollars in damage if not addressed quickly. 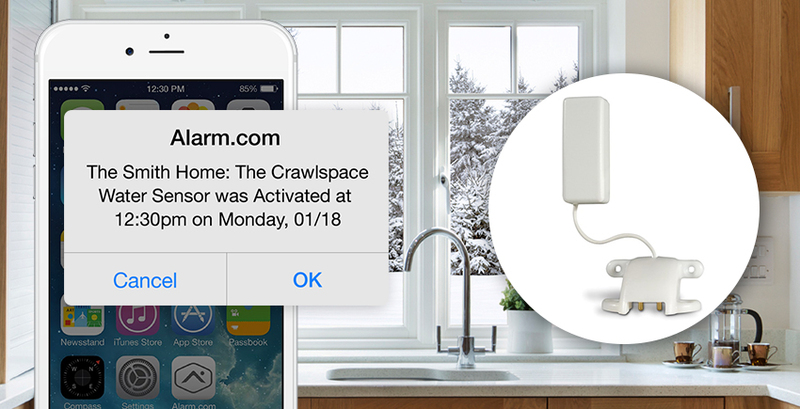 Your Alarm.com dealer can place smart water sensors in danger areas—under sinks, or in the basement by the sump pump—which will alert you in the event of a burst pipe. You'll be able to call a local professional to the house immediately, minimizing the damage and the cleanup costs. If there's a fire at the property and you have smart smoke detectors connected to your system, your professional monitoring station will be alerted and quickly dispatch local firefighters to your home. Unlike many connected security products which only work via broadband connection, Alarm.com uses a wireless, dedicated cellular connection to communicate with your app and with professional monitoring services. This means that you don't have to pay for broadband during the off season, and your property will stay connected even if there's a power outage. Want to get started before you leave? We have a huge network of professional smart home security providers who can quickly install, set up and begin monitoring a system in your vacation home. For peace of mind and a year-round connection to the place you love, click here and get connected.